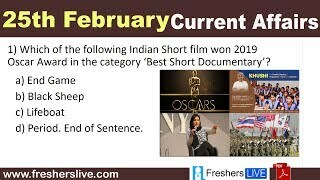 Current Affairs 25th February 2019: Instantly obtain Latest Current Affairs 25th February 2019 with all essential info, Be the first to know all the Current affairs 25th February 2019 top news, Major Issues, Current happenings, Important events in National as well as International level with clear explanation. For all competitive exams and Interviews, equip yourself with the Latest Current Affairs 25th February 2019 granted here. Mayank Markande made his senior Team India debut in the first Twenty20 International against Australia in Visakhapatnam. The 21-year-old spinner Markande hence became the 79th player to represent India in the shortest format of the game. Markande played for Punjab in domestic circuit and Mumbai Indians in IPL, has taken 99 wickets in 47 professional matches across formats. The Ministry of Home Affairs increased the Risk and Hardship Allowance for CAPF (Central Armed Police Forces) personnel from ₹9,700 to ₹17,300 per month for those up to the Inspector rank. For those above Inspector rank, allowance was increased from ₹16,900 to ₹25,000. This decision came a week after 40 CRPF jawans were killed in a terror attack in Pulwama in Jammu and Kashmir. The decision has been pending since August 2017. A study conducted by 200 scientists from 18 countries has led to the discovery of 300,000 new galaxies using a Low-Frequency Array (LOFAR) telescope in the Netherlands. LOFAR is capable of detecting low radio frequencies which is not visible to other telescopes. Thus, scientists could spot lakhs of light sources, which were once too faint to be detected from Earth. According to a statement by Bank of Baroda, its merger with Vijaya Bank and Dena Bank shall come into force from 1st April 2019. This scheme has been named as ‘Amalgamation of Vijaya Bank and Dena Bank with Bank of Baroda Scheme, 2019’. According to the Scheme of Amalgamation- Shareholders of Vijaya Bank will get 402 equity shares of Bank of Baroda for every 1,000 shares held. Saudi Arabia has appointed Princess Reema bint Bandar, a former business executive and philanthropist, as its first female ambassador to the United States. She replaced Prince Khalid bin Salman, amid fallout over journalist Khashoggi’s murder. She has been a leading advocate of female empowerment in the kingdom. Under construction properties priced over ₹45 lakh will attract 5% GST (Goods and Services Tax), instead of 12%. A residential property priced at ₹45 lakh or below will now be defined as "affordable" and taxed at 1%, from 8% earlier. The new rates will be effective from April 1, 2019. Ashoka University teacher and Wipro Sustainable Fellow, Divya Karnad became the First Indian Woman to be honoured with the “Global Future of Nature Award” for her work on marine conservation. The award is given to 3 people annually, and this year it was given to Olivier Nsengimana and Fernanda Abra along with Divya Karnad. About Global Future of Nature Award It is a prestigious international award that celebrates achievements in protecting wild animals and plant species. Kareena Kapoor Khan named as the brand ambassador of Swasth Immunised India, a year-long campaign initiated by Network18 and Serum Institute of India which promotes immunisation of babies under two years of age. The campaign was launched at Mumbai and Adar Poonawalla, President, Vaccine Manufacturers Association of India and CEO, Serum Institute of India (SII).